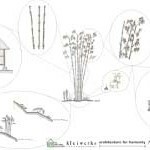 "The over 1200 species of bamboo now cataloged, all have one thing in common—they are all grasses. Each plant spreads itself through the soil by means of an intricate web of roots, also called the rhizome. As the rhizome spreads through the soil, it creates the perfect environment for biological activity. Microbes, which thrive in this moist, regulated temperature, aid the plant in extracting minerals from the soil in exchange for the benefits the plant offers... "